Most new homes these days come with Cat5 cabling in every room so when you decide to upgrade your devices to HD, you will be able to use that cabling to deliver HD video to your displays. How? Using Gefens HDTV Extender… the HDTV Extender uses proprietary, integrated circuitry combined with new chip technologies to send HD video over CAT5 cables, a solution that was before limited to 15 feet. The extension systems work through sender and receiver units that extend the video and is HDCP (high definition content protection) compliant, an encoded “key” engineered to protect content from unauthorized reproduction. Gefen’s HD extenders are designed to accommodate DVI and HDMI equipped components that support HD video resolutions up to 1080I (1920×1200 for computer systems). Increasingly, HD displays and projectors are utilizing either DVI or HDMI to connect to the video source via cable. Both transmit the higher resolutions of HD video, however, DVI uses a 24-pin connector while HDMI uses a smaller connector that transmits video plus multi-channel audio in one cable. HDMI is backwards compatible with DVI, making inexpensive adapter solutions available for system integration possibilities. 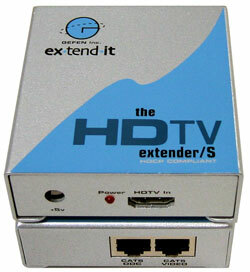 The HDTV Extender will cost you about $500 and is available directly from Gefen.